Amalgamated Engineering Union agrees to allow women workers in munitions factories. 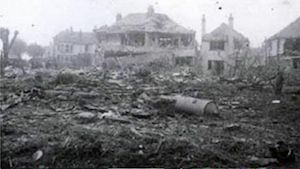 German mine-carrying bomber crashes on Clacton, Essex; two civilians and four Germans killed, 156 people injured. Rudolf HÃ¶ss is chosen to be kommandant of Auschwitz. The Luftwaffe begins a series of 8 consecutive night raids against Liverpool. Dissident forces in Iraq, led by Raschid Ali, surround the RAF airfield at Habbaniya and order the RAF to cease flying. Meanwhile in Greece, the evacuation of some 43,000 troops and civilians to Crete is completed. A total of 14 Hurricanes and 7 Royal Navy aircraft are available to defend the island against the enemy onslaught. German attack on Tobruk is repulsed. Heavy fighting also continues on the front around besieged Leningrad whose inhabitants are suffering from bombing, disease and starvation. The siege of the Crimean fortress of Sevastopol by the 11th Army continues with a ceaseless bombardment by batteries of heavy guns (up to 800mm) and hundreds of bombers (up to 1,000 sorties a day) of Luftflotte 7. The Japanese capture Monywa and Mandalay. The fall of Monywa was especially serious as this threatened to cut off the British withdrawal towards India. This turned a reasonably well organized withdrawal, in to a headlong retreat as British troops tried to avoid being cut off. The Lexington and Yorktown, link up 250 miles south-west of Espiritu Santo, and begin to refuel. The Messerschmitt Me 262, the first combat jet, makes it’s first flight. The Imperial Conference opens in London. A military mission from Tito arrives in London, his 60,000-strong army is now the recognized force in Yugoslavia. Martin Bormann, private secretary to Adolf Hitler, escapes the Fuehrerbunker as the Red Army advances on Berlin. Grossadmiral DÃ¶nitz, following the death of Hitler, assumes his duties as the new German head of state. The U.S. Ninth and British Second Armies link bridgeheads over the Elbe. General Walther Wenck’s Twelfth Army falls back to Elbe with wounded and refugees and try’s to negotiate with U.S. forces. The U.S. Third Army reaches the German/Austrian border at Braunan, 70 miles East of Munich. DÃ¶nitz orders the utmost resistance in the East where tens of thousands of German civilians are still trying to escape from the stampeding Red Army. Joseph Goebbels, Hitler’s master of Propaganda, orders his 6 children killed with poison. He then orders his SS guard to shoot both himself and his wife. The Cessation of hostilities and surrender of all German forces in Italy is announced. This is as a result of unauthorized and secret negotiations with the allies by the German C-in-C, General von Vietinghoff. and SS General Wolff. New Zealand troops capture Udine, 60 miles Northeast of Venice and makes contact with Tito’s partisans in the Trieste area. The situation is now desperate for the surrounded Germans of Army Group E in Yugoslavia as Titos partisans reach the river Isonzo near Monfalcone. Indian paratroops land to the South of Rangoon, as the Fourteenth Army captures Pegu. The Australians land on Tarakan Island off Borneo.